Later that day the temple leaders bring the devotees together for an enormous harinama party. We board the sankirtan vans which are equipped with wooden benches running along both walls, making it more comfortable for the devotees and enabling the vehicles to carry more passengers. Vans stuffed to the brim with human cargo shuttle off to their destination. When we arrive in downtown San Francisco, throngs of holy name chanters disembark and assemble. Kesava and Gurukrpa, ready to deal with any troublemakers, take positions at the head of a double file line of devotees stretching for more than a block. We march through the San Francisco streets, past citizens, tourists and shop owners, carrying the names of God on our tongue, as confident as Lord Caitanya’s sankirtan party confronting Chand Kazi. When we reach the park, Yasodanandana unleashes an earth shaking kirtan. His right arm is wrapped around the mrdanga as he beats it wildly with his left hand and incessantly leaps up and down, chanting with extreme vocal ferocity. At the peak of his ascent he arches his back, bringing his feet nearly to eye level of the devotees standing before him and I’m dead certain he could easily break the world high jump record. I swish the whompers while marveling at the energy of Krishna’s devotees. We chant throughout the afternoon, then return to the temple. That evening I ready myself for the next phase of tapasya. Kapila, Bansidhari and Bhakta dasa, all excellent cooks, are assigned to make the bread that will be served at tomorrow’s festival. Myself and a couple other devotees will assist them. We have the use of a professional bakery in Berkeley but we can’t start until after hours. In the black of night we drive across the Bay to begin our service. After several hours of mixing and baking, we offer and test (taste) the sweet bread -- and it’s good! We load up the prasadam and take off, arriving back at the temple with just enough time for a couple hours sleep before mangala-aratik. If you want to learn this Krsna consciousness movement, we have got enough books. You can scientifically and philosophically study. But if you have no inclination to study, if you simply take to this chanting of Hare Krsna, gradually everything will be revealed unto you, and you will understand your relationship with Krsna. I thank you very much for participating in this ceremony. Now let us chant Hare Krsna and proceed with Jagannatha Swami. Hare Krsna. Prabhupada is seated on the chariot of Lady Subhadra. I stand at my station, bearing one end of a pole that protects straying paraders from getting flattened like a capati by the gargantuan right, front wheel of Lord Balarama’s cart. At the head of our caravan is a wonderful, twenty foot tall, papier-mache murti of Lord Caitanya with arms uplifted. The big, beautiful, blissful parade begins and we transport the Supreme Siblings and Their most devout servant to the festival grounds as we wind through Golden Gate Park on one leg of our journey back to Godhead. After the lecture waves of humanity surge back and forth while kirtan roars in the background. VJ Swami seems particularly fond of the laddus, even though they’ve melted together in the hot sun, and he raids the tent throughout the day. Many of the donated cherries being distributed have gone bad and the baked sweet bread is considered second-class next to puris fried in ghee. Aside from these preps there is a drink and only one or two other items on the menu. To make things worse, I hear that Prabhupada is served the rather skimpy feast on a paper plate, and word comes back that he is not pleased. At the end of the festival I’m recruited to help bring the carts back -- another late night service. My cardigan sweater is inadequate for the nippy Bay evening but I get by. When I return to the ashram the floor is carpeted with bodies -- you could not fit a sheet of paper between them. Still I manage to hunt out a little space near the door. I lie down and immediately start to drift off. Suddenly I feel someone’s foot pressing down on my head. In my typical manner, I prepare to lash out against the "bumbling oaf" who stepped on me. But something holds me back and I consider that this must be a soul who’s been working hard all day, a dedicated servant of Lord Jagannatha, and he’s just placed his foot on my head --I’ve been blessed! As soon as my attitude reverses I feel ecstasy -- genuine ecstasy! Again I doze off but I’m too enlivened by the day’s events to sleep deeply. Rathayatra wheels keep turning in my head. Big, beautiful, blissful, rolling wheels. For the rest of the night I happily dream of Rathayatra wheels. The following day some of the senior devotees have darsana with Srila Prabhupada in his room. Prabhupada: ... Syamasundara inaugurated this Ratha-yatra here. You know? I advised him to perform Ratha-yatra on a motorcar, and that was the first Ratha-yatra. Then gradually it came to cart, now it is three. It is very nice. We are improving. More improve, more and more. Your prasadam this year, I think it is not sufficiently distributed. Why? Makhanlal: Not sufficient amount, you mean? Prabhupada: Yes. Previous year... Anyone? Everyone you have got? All right. So this is the difference. I have been in Moscow. So there is... I couldn't find this. I could not eat fruit. Now your country, Krsna has given so nice, so nice flowers, and so nice Vaisnavas. And that country is very proud of advancing, but there is no fruit, there is no flower, there is no Vaisnava, and there is no freedom. And this is the... They are proud. You see? "We are advanced." This is the... There is a story, one worshiper of Durga... In Bengal, they worship Durga Mata. So it is a story, the Durga Mata, the Goddess Durga is asking the devotee, "My dear boy, you are happy?" "Yes, mother, I am very happy. Simply two things wanting." "What is this?" "I have no food, I have no clothing." Just see. This is story, just try to understand, that "I am happy, but two things wanting: no food, no clothing." Is that happiness? No food, no clothing. Similarly, this Russian country, they are very much proud of advancement, but no food sufficient and no freedom. No food and no freedom, that's all. This is the sum and substance. As we pack up and get ready to head back to San Diego, I reflect on my visit to the Bay. This was my first Rathayatra and my first time seeing Srila Prabhupada. Perhaps an immature part of me was hoping to have a vision or witness a miracle in his presence. Instead I saw a person of great dignity, totally committed to God. Yet this in itself was a miracle, for I’ve never known anyone like him. He is my spiritual master, and I’m just beginning to appreciate him. I’m just beginning to understand that spiritual life is not about trying to see Krsna but about trying to serve Krsna. 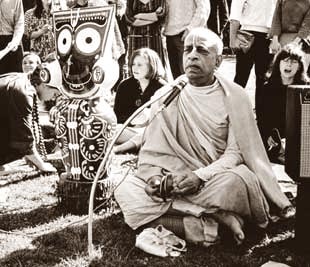 It’s evident that Srila Prabhupada is uniquely qualified to guide me to that stage and I’m deeply grateful he’s accepted me. Prabhupada is indeed wonderful and I’m proud to be his disciple. Don't try to see God, but work in such a way that God will see you. If you think of me and work for me, then I am in your heart. If you love somebody he is in your heart. It is common thing, everyone understands it.